Despite the ongoing regulatory issue in South Korea, the Crypto market is still holding in place. Bitcoin’s price rose slightly from yesterday but failed to break the $12,000 wall. Here’s a quick technical view on BTC. 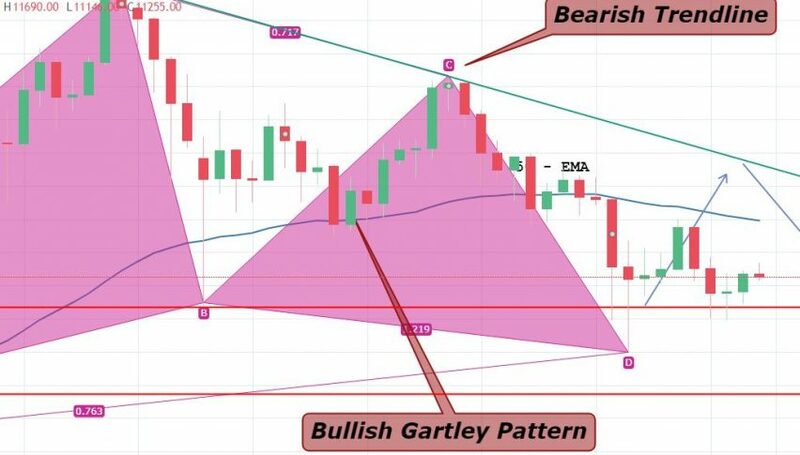 On the daily chart, the BTC has formed a bullish pattern called “Bullish Gartley”. The pattern has completed the C to D wave at the $9,000 level, and Bitcoin has been trading above the same level since last week. The leading indicators are holding in the oversold zone, indicating the potential for a bullish retracement. I would highly suggest the strong support level of $10,335, as the coin is bullish until the market is above this level. Below $10,335, we may see an additional selling trend until $7,721. The current idea is staying bullish above $11,125, with a stop below $10,100, and take profit at $12,250, and $14,150. Good luck and have a profitable day!